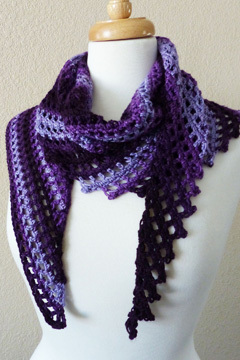 This fun asymmetrical crochet scarf was inspired by a knitting pattern with the same basic shape. It’s worked in an easy-to-memorize 2-row repeat using sport weight or worsted weight yarn. The length is customizable and allows for every bit of the 200-300 yards of yarn to be used. If a larger scarf/shawl is desired, just keep on crocheting with more yarn to the size you want! 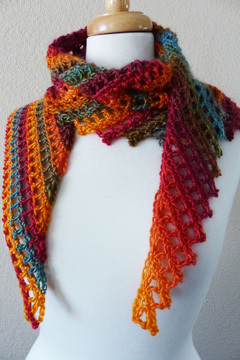 This quick project looks absolutely fabulous with color-changing yarn! It’s a relaxing crochet project that you’ll finish in no time!!! The pattern includes written instructions, as well as symbol crochet charts for the scarf and 2 options for the last row (in case you’re running out of yarn). This pattern is written in US and UK crochet terms. Both patterns are included with purchase. Please pick the pattern with the crochet terms that you’re familiar with to download. Note: Photographed models made with Premier Yarns Deborah Norville Serenity Garden in #800-07 Crocus and Red Heart Unforgettable in #3977 Sunrise.